The AMETEK PDS linear actuator product line is an industry leader for flight controls and other critical applications. We offer standard off-the-shelf and custom engineered designs for any application. Common applications include: Surface trim, Flaps, Ram air doors, Anti-ice and Valve control. 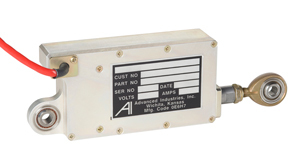 The first of the linear actuators we certified was the ACL12 series matrix actuator, which is currently installed in various applications on several different aircraft platforms. The matrix actuator concept allows thousands of different actuators to be created by changing the motor windings (actuator power) and one of the five standard gear ratios (actuator speed). Changeable stroke length, rod end configuration and ten standard connector exit points make this off-the-shelf actuator easily customized to any customer configuration. Following the ACL12 actuator, we developed the ACL23A for roll and yaw trim applications; the ACL23 is a dual load path derivative of the ACL12 series actuator. Most recently the ACL34 has been certified and entered into service in a flap application. The ACL34 offers a significant increase in force and stroke, when compared to previous applications. Operation loads from 10 lbs. to 3,300 lbs.